A cross-departmental team of researchers at Sylvester Comprehensive Cancer Center at the University of Miami Miller School of Medicine has received a five-year, $2 million grant from the National Cancer Institute to study ways to protect kidneys from radiation therapy. 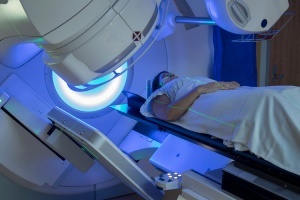 A patient undergoing radiation therapy. Specifically, the investigators will be seeking new information about the molecular mechanisms of radiation nephropathy — a form of kidney injury and functional impairment caused by radiation therapies for cancer. A serious complication contributing to chronic renal failure — which may not present until months or years after irradiation — nephropathy currently has no clinical preventive or therapeutic treatments. The researchers’ long-term aim is to reduce toxicity. The study’s principal investigators are Dr. Marples and Alessia Fornoni, M.D., Ph.D., professor of medicine and molecular and cellular pharmacology, and chief of the Division of Nephrology and Hypertension. By investigating the regulatory mechanisms of kidney toxicity, the research team believes that it can expedite the search for potential therapies to protect the organ’s podocyte cells from radiation injury. Radiation damage reduces the levels of a specific enzyme — sphingomyelinase-like phosphodiesterase 3b (SMPDL3b) — in kidney podocyte cells. This reduction is associated with the risk for developing radiation-induced toxicity. SMPDL3b, along with other proteins and lipids in the podocyte, regulates cellular morphology and function after radiation damage. The research team hypothesizes that protecting SMPDL3b expression could mitigate radiation damage in the kidney. Because it binds to SMPDL3b, the monoclonal antibody rituximab, an FDA-approved medication for some cancers and rheumatoid arthritis, has the potential to prevent radiation-induced kidney damage. The group will investigate if rituximab and other therapeutic drugs can maintain enzyme levels in kidney podocyte cells at a level strong enough to thwart or minimize radiation toxicity. Moreover, using unique mouse models that it developed, the research team will investigate the molecular mechanisms behind kidney toxicity. Because these models have been engineered to have different levels of SMPDL3b, the researchers can study the radiation-induced mechanisms with more detail. Other members of the research team are Youssef Zeidan, M.D., Ph.D., assistant professor of radiation oncology, Sandra Merscher, Ph.D., research associate professor of medicine, Shanta Dhar, Ph.D., associate professor of biochemistry and molecular biology, and Deukwoo Kwon, Ph.D., a scientist at Sylvester’s Biostatistics and Bioinformatics Core, who will be the team statistician.